In the early (around 96 to y2k) i had designed few transmitters. Actually when i applied for amateur radio license, it took really long long years to get one license. I gave exams in 94 with vu2lex. After it was boring and nothing to do, so made this transmitters. two shown. there is one more. Its not original, but i have not exactly copied anyones ckt. different modules were taken from different sources and made compatible to work for me. My first 'elmer' was vu2lex om faram khambhata, he allowed me to copy his amerikan book.it contained ckt of w1fb. his set up was all home made 1 watt cw tx diode dc rx, frequency counter using hct ic.cmos keyr with memory. atu, rf probes and a full 2foot by 2foot crate of various ckt modules he made.He never came on fone. After two visit i lost touch with him. he went somewhere for mqth and i also became busy. Then by chance, i made diode detectors and they worked for me. Those were my starting days. I did not know how to wind the coils, even how to solder ! but i learned everything. thats another story. This is a very low power xtal controlled AM transmitter capabale to provide one way reliable link over few hundred meters. a sturdy metal cabinet.built in dc power supply, microfone (power supply),xtal oscillator, af amplifier, modulator, one stage rf amplifier. actual rf power is in the few milliwatt range. few fotographs and ckt diagrams is given here for reference.If time permits will trace out components value and make a list. Not used since a decade. I hope to revive it and gift ( i dont need money for it) to someone (if s/he wants to vu3hm* in rajkot city) for local (h)AM Experience. As one transistor oscillator did not give me long range with small antenna i made this big ckt. Antenna:- i used approximately 30feet long wire as antenna. No care was taken to measure rf or tune anything. I did not have ATU, simply connected the wire to the collector of pa and presto am signal came out very clearly. Litte tuning of pa core furtheer increased the clarity. I was able to receive the signals in portable am,fm radio plus cassette recorder ! This was placed into our second home and it was my bug, a private radio and a caretaker of intruders. In facebook, my friend vu2uuu gave me a hand drawn sketch of one 80 meter tx from his own experiments. Let me reproduce his ckt. I am thankful to OM Kaustava saha for taking out the time to hand draw , fotographa and publish it in facebook. that really reflects his love and care for fellow hams. Thanks OM Saha. I had seen a circuit on internet & it works very well. I am sharing my hand sketched circuit diagram for reference. On the antenna side, you can make a standard 40m antenna (prefered) or a random long-wire will also be OK. Take a 500pF variable capacitor & fix the L2 coil. The L2 coil is made on a 0.6cm former using 10 turns of 22 SWG Cu wire, as shown, to form a tuner circuit in between the 2 section of the 500pF variable capacitor. The L1 coils is made on a Ferrite Rod, with a 1.5cm dia former & 10 turns of 22 SWG Cu wire. Dont forget to use a good heat sink with the BFY50. The X-Tal needs to be 40m for better local activities, but you can use 20m X-Tal without changing any components. Use a 12v Battery Power supply, because a AC-DC adapter will generate considerable humm in your transmission. Hope the circuit suits your requirement. This all flooded nostalgia. I also had made similar looking ckt from "123 projects"- a book containing the 123 various projects related to the af, rf,digital gates etc. . Please dont reproduce my ckt i have dismantled it due to poor performance. but, i taught me lot. Instead use vu2uuu ckt it will works. Carbon mic was hard to find. I requested a fone repair guy and he gifted one carbon mic for a free from a broken fone. wow ! 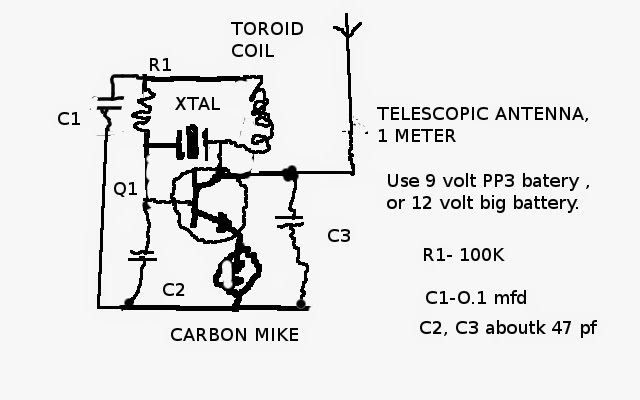 When i made one transistor ckt with 2N3053 (a very good rf transitor) , only 1 meter telescopic antenna was connected. 3.579 kc xtal did not worked, then changed freq to 27 mhz cb xtal it gave me a range of about 30 meter on 12v batery, but i did not realize that real problem is small antenna and very very low power. i used 100k for base bias. when you use 15k as base bias, the current increase so does the power. 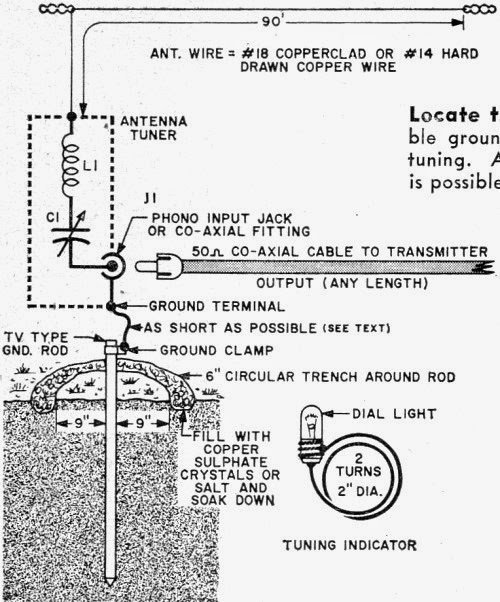 And there is real antenna, tuner and ground. ATU and very long antenna. Now, i realized why i did not got the (range) a decade back ! When my dsb tx on 14318kc was not loading OM vu2kd told me to take a gang and wind a few turns air coil and put coil between it and tune it with diode two diode and led detector. He explained over fone in length but I could not grasp it ( beleive me please !). but vu2uuu drawing gave it clarity. I will certainly try this LC ATU. I am not yet understanding its theory but if practically it works who cares for theory ! There is an interesting story. During my second transmitter testing with small wire antenna (may be 30feet) i was puting some morse code practise to nearby radio for learning and suddenly some reply was coming through. I could not understand it, but gave out my call sign (?) and signed off. I never had intended to radiate more than 300 meters. Next time never heard him. poor fellow ! but i never received any rst report or any QSL card. but that proved my second transmitter was working nice, pumping out few watts (!). but, i never tested it again with wire. beauty is that during this whole testing-time this transmitter was connected with dummy load and as a leak-wire / gimmick antenna was connected ! when this happened ! dont remeber the year. Dummy load had become very hot, it burned my finger so i remeber. I had used IRF510 as PA.
i had qsy to somewhere in pursuance of mqth.total about a decade years (2004 to 2012) So, when i started putting things back togather in 2012, that is the reason my tech is little old (10 years) and you find no digital things.... but, it is going to improve. only one aim is to be on air. i once heard the vu2pua from bhopal.might have audio recording also. he used just 300mw and tuned vertical. i regularly hear vu2kd with just 5 watt bitx homebrew, i also hear regularly vu2seg with homebrew 15watt bitx. 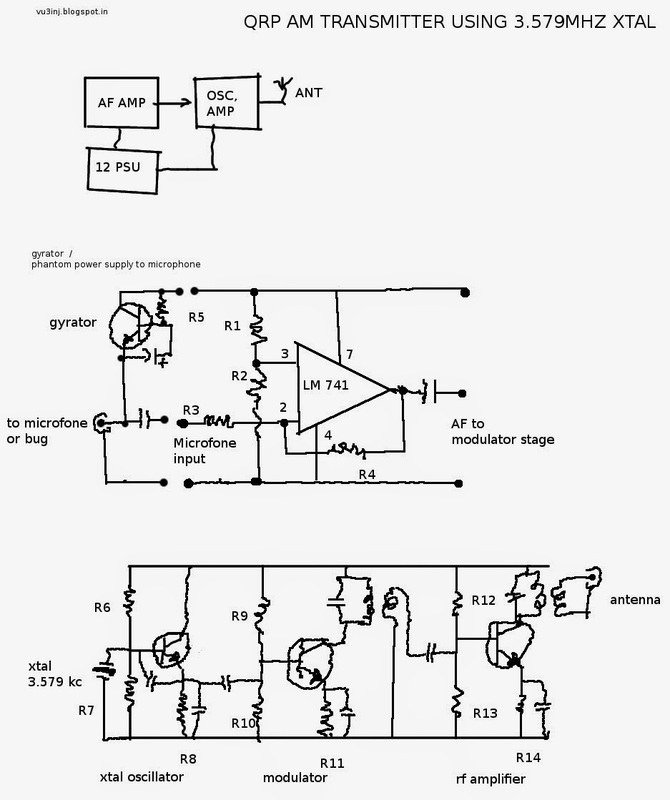 so, QRP is possible. my friend vu2isr also helped in checking my signals on air as he is interested to show that even with qrp, west to south qso is possible. This is another transmitter. first i made mighty michigan and then added the pa stage consisting of bd139 and then found a small modulator transformer 1k to 8ohm used in small af amplifier. 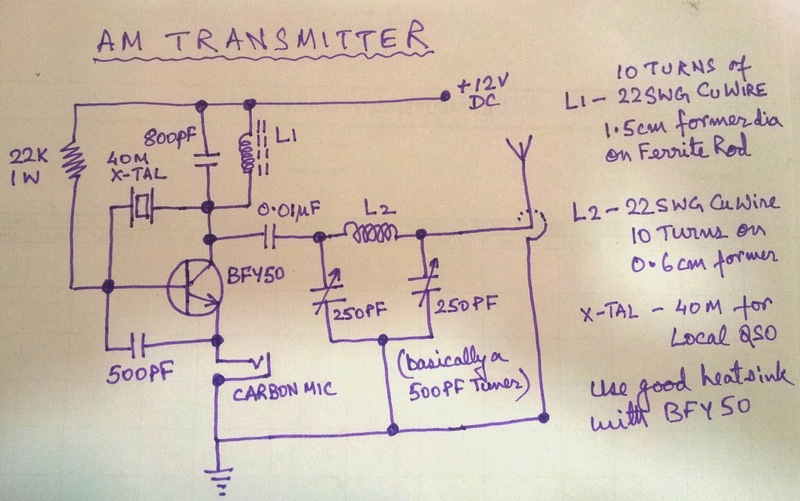 with help of lm741 and push pull transistor i drove it will success. My problem was not able to load the antenna. Has anyone faced the similar problem. Various answere came, like , go to a seniour hams, have atu, use swr analyzer etc etc. i dont have access to these tools ! do you have any idea ? it seem most of guys are using the commercial ones. okey. 6meter tx and rx (ra3aae) experiments.